Dogs are one of the most faithful and human-friendly animals of this planet. People keep them in their homes and treat them like their family members because they are well-known for their bound and remain loyal to their owner throughout the life. There is a relationship of love and care between a doggie and the owner, but it demands some space too. If you are owning a pet, then it becomes a responsibility to take care of their needs and grow them well. Besides love and attention, you have to provide proper training to your pet, including involvement in physical activities and behavior management, like food consumption, discharge of waste, playing with children, etc. At times, canine owners have to lock them as well in order to discipline them and to avoid any embarrassing situation. But wait! Are you thinking that locking your pooch will negatively affect its behavior? Well, that’s not true at all. A well-designed cage can be a real treat for your doggie rather discomfort. 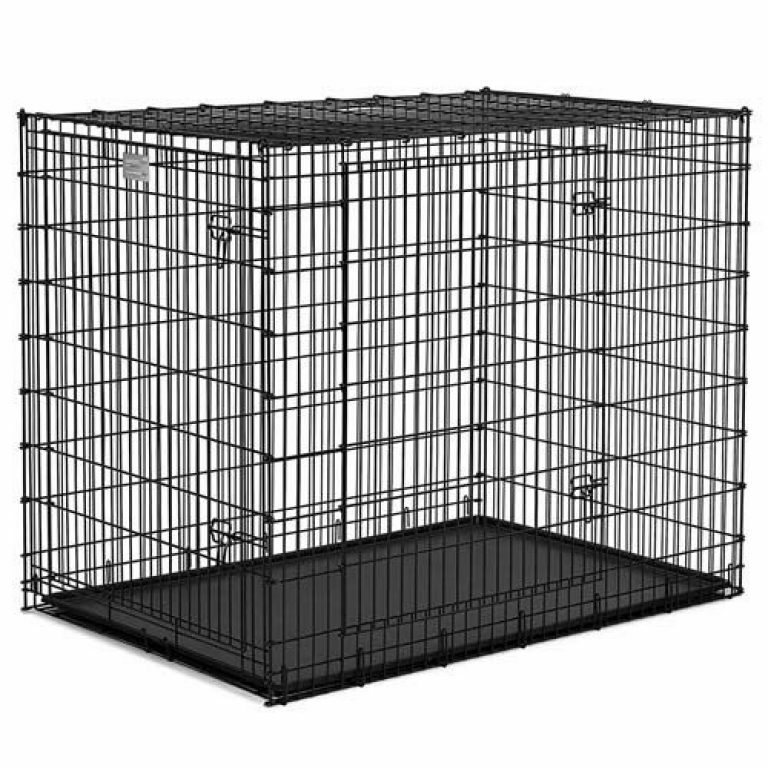 For this purpose, several companies have introduced cages these days for keeping your beloved safe and comfortable. If you can’t decide which one to choose, then here it is! Heavy Duty Dog Cage Crate Kennel is designed to keep your doggie secure and portable at the same time. Now your canine can easily stand, lay, sit and sleep in this crate because of its spacious structure. SmithBuilt is a renowned maker of dog kennels as they have always given importance to the comfort of pets than anything else. 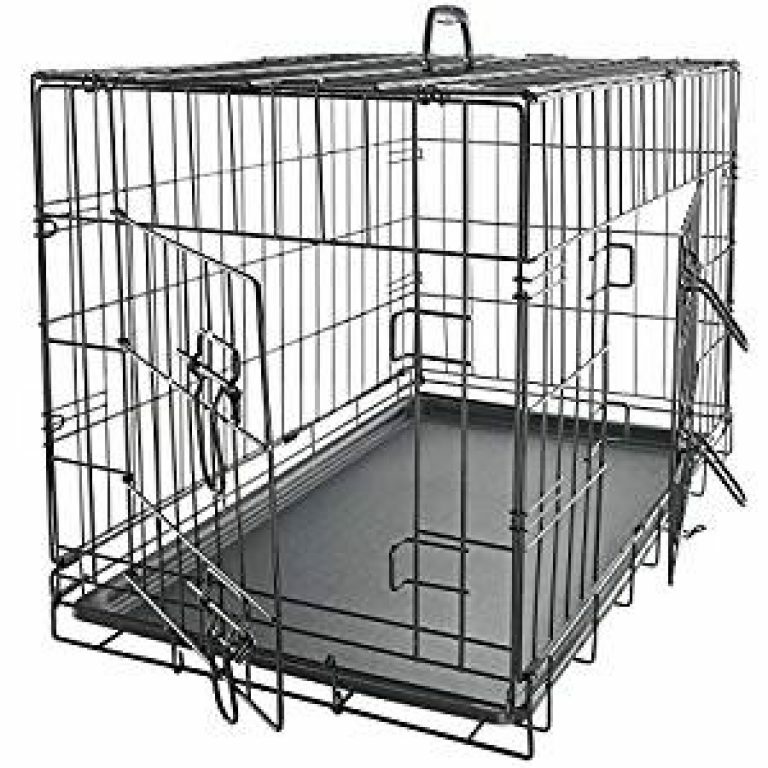 This heavy duty dog crate is equipped with a detachable metal pan, which is difficult to break by a doggie. You will not face problems with this pan as its material is high-quality and long-lasting. It is easy to wash it by simply taking this pan out and giving it a quick wash. Moreover, its flooring pieces do not retain pet odor, corrode, stain, warp or rust. In this way, your pet can remain clean and healthy. A lip is also integrated on lower pan around the perimeter for containing all kinds of mess. SmithBuilt dog crate features a top door opening. Owners can feed their doggie with the help of this opening. You can smoothly use it for putting your pet in or taking it out from top side of the cage. Front door is also included in this crate to further ease your life. Two slide-bolt latches are incorporated for locking the front door whereas one latch is available for the security of top opening. In short, the manufacturers of this cage have not compromised on the safety of beloved animals. 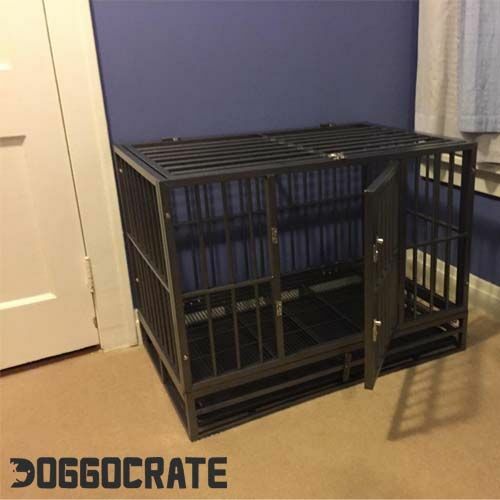 Unlike the inferior canine kennels, this crate has a multi-layer and ultra-durable finish, which is much durable than ‘powder’ or ‘electro’ coats. Its robust design is corrosion, fade and rust-resistant. It is an attractive cage that offers 360-degree views and optimal airflow. Premium quality material is used in its making so that it can last for a longer time period. Four rolling casters are included in this cage to provide maximum movability. Two of these wheels can be locked for preventing any accidental movement. Now you can move this kennel both inside and outside your home conveniently. Moreover, you can also take your pooch with you when going for outing or vacations. Thus, this specific product is best suited for both outdoors and indoors use. Isn’t it exciting to keep your canine with you all the time? The best thing about this crate is that anyone can easily assemble it as it only needs minimal effort to set up. You will just require few minutes in constructing this cage. It is suggested to assemble it in a shaded area away from direct sunlight because metal rods can heat up and harm your pet. This product is available in multiple sizes such as 36, 42 and 48 inches. 36-inch long crate is 29 inches tall and 24 inches deep. 42-inch kennel is 34 in. tall and 30 in. deep. 48-inch cage is 37 inches tall and 33 inches deep. 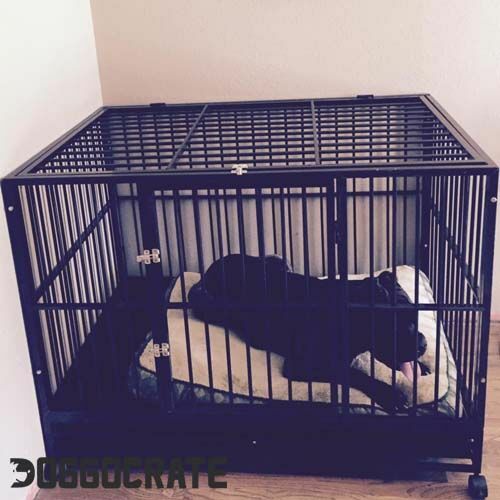 The largest crate can even accommodate a big size dog easily. 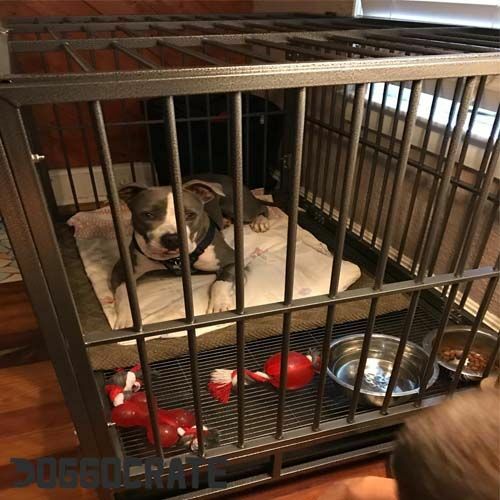 You would be glad to know that SmithBuilt Dog cage is available in two different colors, that are; hammered silver and black. 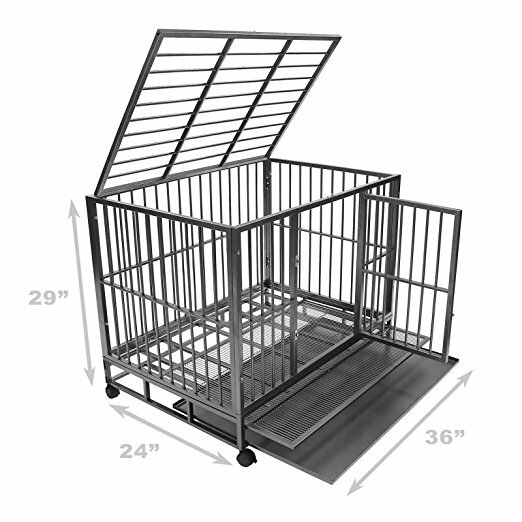 This cage features a corrosion and rust-resistant steel tray and floor grate. Two trays are provided within the package that can stay in their place to prevent slipping. You can quickly remove these trays whenever you want to for cleaning purpose. Safety and security of your pet are the most important elements to consider while purchasing a cage. This particular crate is equipped with both these features. Dual locking system is in-built so that your doggie can remain safe and secure inside this kennel. This crate is not only durable but also has great value for customers because of its user-friendly features. However, you must be careful in selecting the size of the cage in order to provide maximum comfort to your canine buddy. The kennel must be 4-6 inches longer than the body length of pooch and 4-6 inches larger than shoulder height. This dog cage is not only secure but also has an attractive and unique design. The finish of this crate is corrosion and rust proof. Hence, you can utilize it for a lifetime, but be careful in leaving your doggie out in sun inside this metal cage. It is an inexpensive and heavy-duty crate along with all essential features. What else do you need for your loyal partner? SmithBuilt Crates are known for their durability and superior quality material when it comes to heavy duty dog crates. This dog crate comes in 2 colours & 3 sizes with rust, corrosion and fade resistant finish. After months of working with a collapsible wire/mesh cage, that my 85-pound pitbull has been bending like silly putty, I’m pleased to have found this crate. The reviews were mixed, I wasn’t certain about it, but I took a shot and I am glad that I did. This is truly a heavy duty crate with thick bars. The size is ideal so for my pit. Big enough to stand if she wants to, but not too big. The latches working fine and it was simple to assemble. how far apart are the wires and what is the wire gauge of this crate? also does this crate fold and travel-friendly? It’s 20 gauge steel tubes or bars and they are around 2 inches apart. Your dog can chew them all he/she wants but he/she ain’t bending them. As for the folding, it is not like wire mesh cages which simply collapses and fold. Although it is travel-friendly if you are willing to reassemble it. It will take around half an hour at max to either assemble or disassemble this crate. It weighs around 63 lbs so it might be a little too heavy for some people to take it with them.